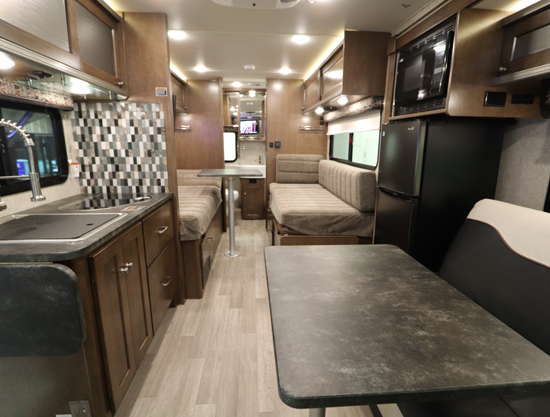 With more than 14 years of Sprinter RV experience, Winnebago designed the innovative Vita and Porto to be the most trouble-free and easy to operate Sprinter class C in the industry. Best of all, the new Vita and Porto provide industry-leading Winnebago quality and performance at an affordable price. 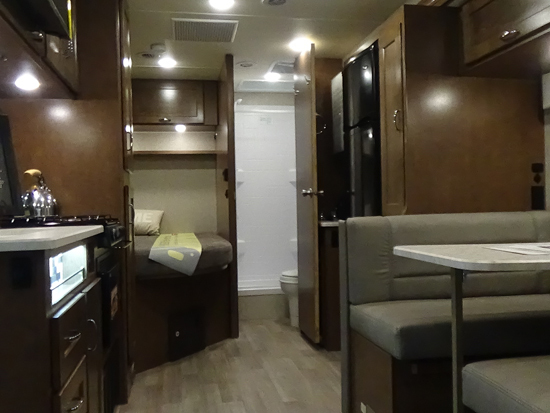 Here are a few of the advantages of the Winnebago Vita and Porto over the competition. Watch our video on the Winnebago Vita vs. the Competition here. Best-in-Class OCCC – The Winnebago Vita and Porto are segment leaders for occupant and cargo carrying capacity. The OCCC is listed on the required yellow weight label that you can find inside one of the entry doors to the motorhome. The OCCC figure is the maximum allowable weight for all occupants, food, tools, and personal belongings, including the weight of all the fresh water that you carry. Even the weight you put on the hitch must be included in your cargo calculation and the total must be less than the OCCC for safe operation of your RV. Based on the option and floorplan selection, the View and Navion typically provide well over 1,000 pounds, while the new Vita and Porto were designed to provide up to 1,800 pounds of capacity. Increased Maneuverability – At just 24’7” the Winnebago Vita and Porto lead the class in maneuverability and allow users to park in smaller campsites that the competitor’s coaches may not be able to. The Winnebago Vita and Porto also have a 5,000-lb. tow hitch and plenty of OCCC to be able to tow a small vehicle. Standard Solar – 200-watts of solar help keep your batteries fully charged and extend off-the-grid use. The Vita and Porto’s solar system is also expandable up to 450-watts. Most RVs in this segment come with solar prep or solar as an option for an additional fee. 1,000-Watt Pure Sine Wave Inverter – The Winnebago Vita and Porto’s 1,000-watt pure sine wave inverter safely powers electronics including the refrigerator, TV’s and certain 110V outlets from the coach batteries. This allows you to safely power your personal electronics without fear of a surge. Dual Group 31 Batteries – The Vita has industry-leading battery capacity from the dual group 31 batteries providing 210 Amp Hours. The competitors either come with a single RV battery or dual batteries that do not have the 210 Amp Hours. 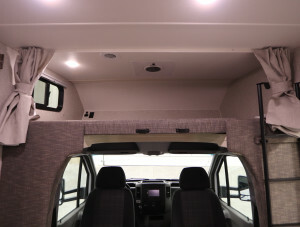 Connectivity Roof Port Wiring Access – Easy wire path for outdoor equipment to the inside of the coach. Allows the owner to install their desired equipment – like WiFi boosters, antennas, etc. As equipment becomes outdated, this port allows for easy change out and replacement for new equipment/wiring to be run inside the coach. Unique Bathroom Layout – The bathroom door design in the Winnebago Vita and Porto 24P provides a large passageway to enter or exit the corner bath. When the door is closed, it creates a 90-degree corner for more usable inside space. Easy entry and exit are possible with the slideroom extended or retracted. Compressor Refrigerator – The Winnebago Vita and Porto have the largest refrigerator in the class and are the only ones that have a compressor refrigerator. Compressor refrigerators run more efficiently and cool more effectively than absorption refrigerators. Flexible, Multi-Use Storage – The Vita and Porto’s flexible storage areas are designed to be configurable for multiple uses, such as a pantry or a closet. Winnebago SuperStructure Design – Winnebago’s SuperStructure design creates a durable and strong motorhome. Key elements include – roof, sidewall, and floor interlocking joints, laser-cut steel and aluminum substructure, advanced E-Coating for corrosion protection, Thermo-Panel composite sidewalls with welded tube framework, thermal break and embedded steel plates for secure cabinet and appliance attachment. Large Full-Wall Slideroom – The Vita and Porto 24P have a large full-wall slideroom that encompasses a large section of the drivers side and is 3 ft. deep. New SuperShell Sleeper Deck – Winnebago’s exclusive SuperShell composite hull is produced in a closed mold with injected urethane foam sandwiched the fiberglass outer shell and an interior panel. This superior design strengthens the cab over area and improves the sound and thermal comfort while also reducing the weight and potential for leaks and squeaks. Rear Corner Bed – The Vita and Porto 24F offer an 80″ length corner bed for sleeping comfort. The 24F rear corner bed is the largest in its class. The Winnebago Vita and Porto combine Mercedes-Benz fuel-efficiency and durability with Winnebago’s legendary build quality and innovative features. The 24P features spacious interior, multi-purpose storage, plenty of sleeping configurations and the result is a compact and easy driving package that is perfect for solo travelers, couples or families. 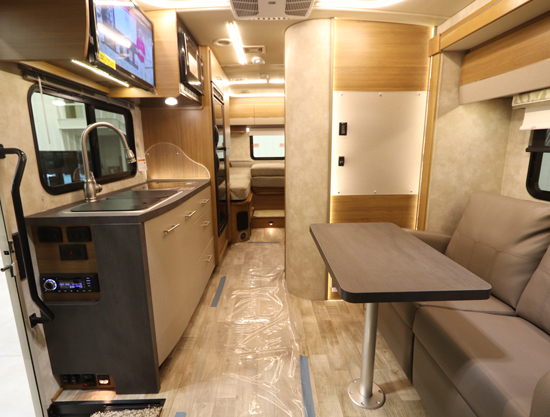 Winnebago’s exclusive SuperShell composite hull is produced in a closed mold with injected urethane foam sandwiched between the fiberglass outer shell and an interior panel. This superior design strengthens the cab over area and improves sound and thermal comfort, while also reducing weight and the potential for leaks and squeaks. The sleeping surface is 49″ x 87″ and comes with a ladder and privacy curtains. The sleeping surface supports 450-lbs, perfect for kids. The dinette in the Winnebago Vita switches from a dinette with two seat belts and a storage compartment to a sleeping surface with expandable sleeping for 40″ x 76″ without the expandable sleeping the dinette sleeps 40″ x 64″. 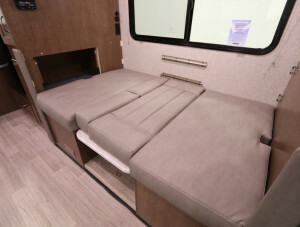 The Winnebago Vita 24F features a walk around queen bed that extends from the driver’s side slideout. This walk around queen bed measures 60″ x 75″ and has nightstands on both sides. 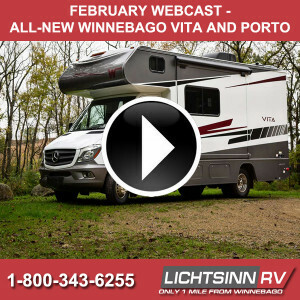 We recently held our monthly interactive webcast on the Winnebago Vita and Porto. You can watch our webcast here. Below are the top questions we received during the webcast about the Winnebago Vita. What is the difference between the Vita and the Porto? Nothing. They are both built by the same people, on the same lines, with the same quality materials. They offer the same options and standard features and are the same price. What are the benefits of the OCCC in the Vita related to competitors? OCCC is how much stuff, water and people you can carry in your RV. The Vita and Porto offer up to 1,600-lbs. Some competitors, like the Forest River product only offer 600-lbs of OCCC which once you get your people and water on board you are at max capacity. Where do the Vita and Porto fit in the Winnebago compact coach line-up? The Vita and Porto are built on the same chassis as the current (2019) Winnebago View and Navion. The Vita and Porto are Winnebago’s offering of the Mercedes-Benz Class C Sprinter Chassis at a more entry-level price. What are the optional features in the Vita and Porto? Should I get a diesel generator? In our experience, the pre-owned Views and Navions we receive with diesel generators typically have less than a 100 hours on them. So if you take the upfront expense of about $4,000 – you would pay $40 – $50 an hour to run your generator. And diesel generators do not offer any additional resale value over LP generators. Why are the options so simple in the Winnebago Vita? Winnebago made many of the features in the Winnebago Vita standard – and the competitors either don’t offer the feature or they cost an additional fee. Like the standard 200-watts of solar, the 1,000-watt pure sine wave inverter, and the electric stabilizer jacks. What is the MPG rating of the Vita and Porto? Conservatively 16-18 MPG based on the testimonials of the Winnebago View and Navion owners that have the same chassis as the Vita and Porto. The Vita and Porto are lighter than the View and Navion so there might be some additional fuel efficiencies gains versus the View and Navion. What are the new, innovative features in the Winnebago Vita and Porto? – SuperShell Sleeper Deck – The strong, lightweight SuperShell Sleeper Deck provides added thermal and acoustic insulation. – Roof Access Wiring Port – allows for the addition of WiFi boosters, cell boosters and other technology without having to cut a hole into the roof of your coach. – Fresh Water Manifold System – eliminated hundreds of connection ports for increased water pressure and minimizes water consumption. What are the tank sizes in the WGO Vita and are they heated? Both floorplans have the same tank sizes with 37 gallon fresh water tank capacity and 41 gallon black and gray tank capacities. And no they aren’t heated, but our RVDA/RVIA certified technicians have the abilities to make them heated by adding the heating pads. How fast does a compressor refrigerator – like the one in the Vita – drain the batteries on a cloudy or snowy day? Very little. Very minimal draw off the batteries. The compressor refrigerator was field tested with only group 24 batteries (the Vita has larger, group 31 batteries, solar and the 1,000-watt pure sine wave inverter) and the batteries lasted 42 hours. Do the windows slide in the Vita? Yes – they do slide open and the large windows allow for great fresh air ventilation. The Vita has a sealed MaxxAir fan, the galley has a roof vent, and the bathroom has a powered ventilator fan. Does the Vita come with front privacy shades? The Vita does come with front privacy shades that aren’t like the cab curtain that prohibits front cab seat usage. When will the Winnebago Vita be available? The Winnebago Vita is currently available. See our inventory here. Lichtsinn RV, America’s closest dealer to Winnebago Industries, has been named Top North American Winnebago Dealer by Winnebago Industries for the last four consecutive years. We proudly sell New RVs manufactured by Winnebago Industries as well as Used RVs. See our Winnebago Vita inventory here. Winnebago’s type C Vita 24P upgrades the over-cab area with extra insulation, both to provide more warmth in colder weather and to ensure a quieter ride. 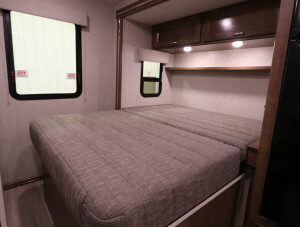 Below the cab bunk and its 49-by-87-inch bed, the driver and and passenger seats swivel so that users sit at eye level when having face-to-face conversations with others in the RV. The full wall slide on the driver’s side of the vehicle is uncommon on a type C. The Vita’s interior is open and spacious in a noteworthy way. The slide runs from the dinette behind the driver’s seat back through the rear bedroom. Another benefit to the expansive slide is the addition of two additional feet of exterior storage compartments, elevating total exterior storage to 40 cubic feet. 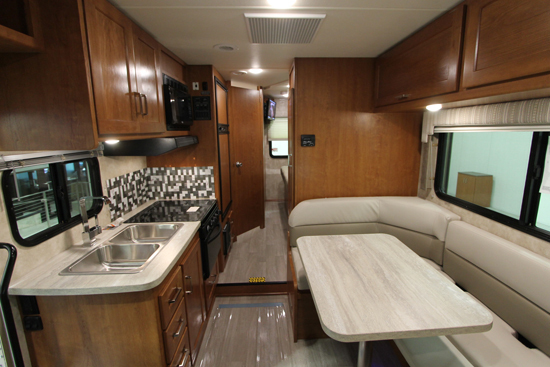 As in many RVs, the dinette transforms into a bed, but in the Vita 24P, Winnebago designers placed cubbyholes on one end to extend the dinette bedding’s length, letting taller consumers stretch out comfortably. The kitchen features European-style cabinetry, a 7.3-cubic foot residential compressor-style electric refrigerator and microwave underneath the stovetop. The new microwave placement resulted from customer feedback about commonly spilling hot food on the cooktop because of the microwave’s height. Rather than being simply wired for solar, the 24P includes 200-watt solar panels as standard equipment. The Vita’s two standard onboard batteries and larger-than-average storage further accommodate off-the-grid usage. The stabilizer jacks extend the 24P’s ability to overnight in terrain more rugged than a perfectly flat concrete pad. The coach is also less than 25 ft. to address tight parking in state and federal campgrounds. Standard outside features include a powered patio awning with LED lights, exterior lights at crucial hook up points, an attachment on the running board for dog leashes or bicycle locks and a backup camera. The Vita 24P is built on a Mercedes Sprinter chassis offering between 18 and 20 MPG fuel efficiency, and is 24 ft. 7 in. What impressed RV News: The 24P offers unusually robust off-the-grid readiness for a type C. The full-wall slide opens up the interior impressively, and the overall look and quality of the interior shouts, “Winnebago.” The coach should meet consumers’ expectations for the legacy brand. 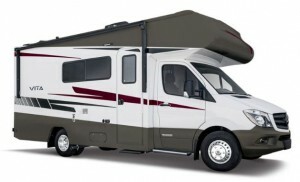 Winnebago Vita Inventory In-Stock now. Lichtsinn RV, America’s closest dealer to Winnebago Industries, has been named Top North American Winnebago Dealer by Winnebago Industries for the last four consecutive years. We proudly sell New RVs manufactured by Winnebago Industries as well as Used RVs. If there is an overriding theme at this year’s RV Open House in Elkhart, Indiana, this week, it is technology. The smart RV is no longer talk of the future; the smart RV has arrived. 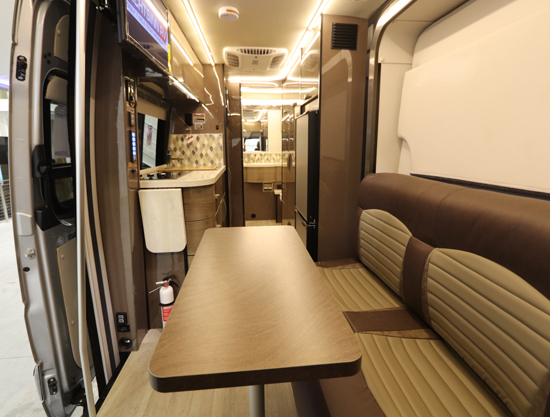 “The industry is definitely moving in the direction of the smart RV,” states Sam Jefson, public relations specialist for Winnebago Industries, which introduced ASA Electronics’ iN-Command system on some of its 2019 offerings. With the iN-Command system, RVers can control RV functions, such as climate control, slide outs, awnings and lights, as well as monitor batteries, holding tanks and auxiliary fuel, from an app on their smart phones. Jefson says Winnebago has rolled out the technology with its travel trailers, which tend to be used by a very tech-savvy demographic, but adds he fully expects all units to eventually be similarly equipped. Winegard is making tech headlines as well as more OEMs prewire their units for Winegard ConnecT 2.0. Some companies are also making this technology standard on their rigs. WATCH OUR LIVE WEBCAST ON CELLULAR AND WIFI BOOSTERS FEATURING THE WINEGARD CONNECT 2.0 WIFI EXTENEDER HERE. Designed specifically for the mobile environment, the Winegard ConnecT 2.0 WiFi Extender + 4G LTE is a long-range, high-performance WiFi extender that increases the range of accessible WiFi hotspots, well beyond the range of a typical smart device. The product uses its multiple, built-in smart antennas to scan and connect to WiFi signals, rebroadcasting them in and around the camp site. The 4G LTE model can also connect to nationwide 4G LTE when WiFi is not available, ensuring reliable, uninterrupted, in-motion and stationary coverage. Users can stay connected to family, friends, web content, entertainment, and now their RV. The 4G LTE ConnecT 2.0 model is now certified with AT&T and Verizon as a 4G LTE mobile hotspot, and RV enthusiasts can either add it to their new or existing data plan by simply swapping out the included SIM card or choose Winegard ConnecT’s data plan, which features no-contract, 30-day plans with no data throttling, so users only pay for the time it’s being used. At last week’s open house, Winnebago introduced the Vita and Porto: A compact Class C diesel built on the Mercedes Benz Sprinter chassis. Both products are equipped with best in class storage, tank sizes and carrying capacity. Other features include a new quiet, durable Supershell composite sleeper deck, a new prewired track and roof panel for Wi-Fi and cellular boost antenna systems and industry leading off the grid capabilities. This can be seen, he says, in the popularity of Winnebago’s Travato 59KL and 59GL, which were introduced at Winnebago’s Dealer Event in March. The Pure3 Energy Management System powered by Volta Power Systems ­­is a powerful, durable, and easy-to-use lithium system. SEE OUR BLOG POSTS, VIDEO LIBRARY AND MORE ON THE WINNEBAGO TRAVATO HERE. Under 200-lbs. the three-module automotive grade energy pack provides 8,700-watt hours. It is watertight and durable; and the steel housing is safe. The 59KL and 59GL come standard with a powerful inverter – a 3,600-watt pure sine inverter – bringing 30 amps of power wherever you are. Travatos also have a dedicated 58-volt alternator, or under hood generator. A simple analog gauge changes color to let users know how much energy is remaining with just a glance. Winnebago Motorhomes is pleased to announce the launch of several new products at this year’s Winnebago Open House event in Elkhart, Indiana. Additions to the motorhome lineup include the Class C Vita and Porto and the Class A gas Adventurer. Vita and Porto: A compact Class C diesel built on the Mercedes Benz Sprinter chassis, the Vita and Porto offer quality and innovation customers have come to expect from Winnebago at an affordable price. Both products are equipped with best in class storage, tank sizes and carrying capacity. Other features include a new quiet, durable Supershell composite sleeper deck, a new prewired track and roof panel for Wi-Fi and cellular boost antenna systems and industry leading off the grid capabilities. The interiors are highlighted by a best in class galley with large counter space, double sink, ample storage and a big panoramic window. The Vita and Porto are available in two floorplans – the 24P and 24F. Adventurer: The all-new Adventurer is the definition of Winnebago Class A Gas luxury. 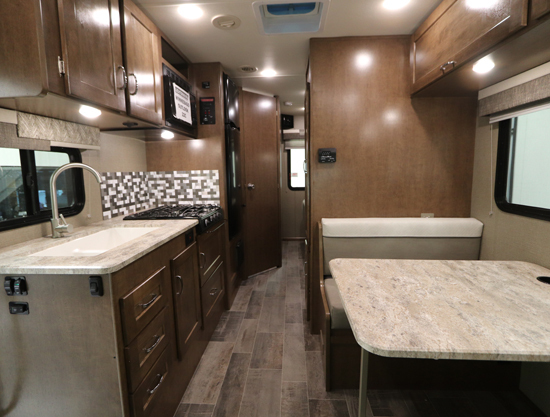 Built with Winnebago’s legendary SuperStructure, the Adventurer offers styling and floorplans to meet a variety of tastes and needs. It is packed with interior features normally found in diesel pushers like: Corian countertops, a Versa driver cab seat and Primera furniture coverings. Key exterior features include an entertainment center, pet leash tie down, an LP system provided in the patio area of the coach and full body paint with chrome mirrors. The Adventurer is available in five floorplans – the 27N, 30T, 33C, 35F and 36Z.